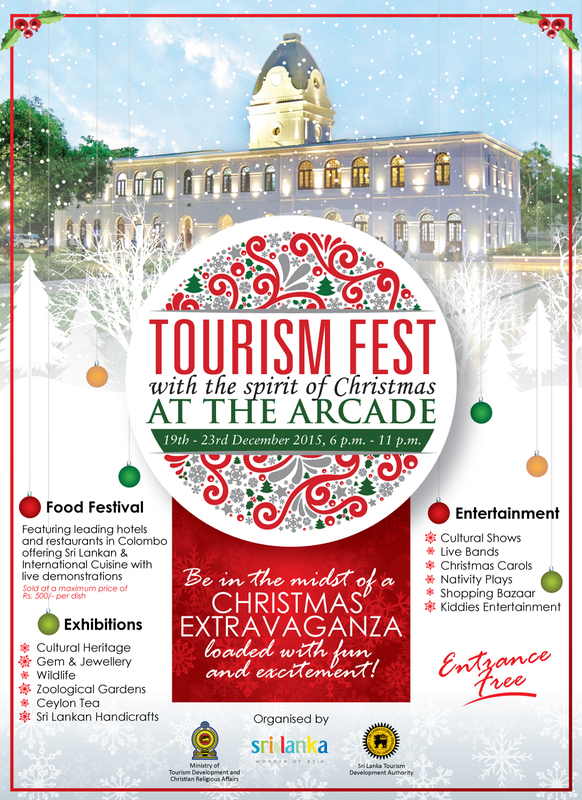 The Sri Lanka Tourism Development Authority (SLTDA) together with other tourism institutions under the Ministry of Tourism Development and Christian Religious Affairs will be organizing the ‘Tourism Fest with the spirit of Christmas’ from 19th to 23rd December 2015 at the Arcade, Independence Square. With the month of December being the peak month for tourist arrivals and festivities, the idea behind this is to portray Sri Lankan food, culture, gems, tea, shopping and entertainment at one venue. One of the main attractions during this Fest will be an exposition of Sri Lankan culture and heritage presented by Central Cultural Fund showcasing photographs, artifact replicas, books including live demonstrations of replication of artifacts. The Gem & Jewellery Authority will also be organizing an exhibition on Sri Lankan gems with a sales outlet as well. The tourism fest will feature stalls presented by leading hotels and restaurants in Colombo with live demonstrations of different cuisines giving visitors an opportunity to learn and experience culinary skills of Sri Lanka and sit and enjoy a meal while enjoying the festive glamour. The Zoological Department and the Department of Wild life will also be involved in this event where each stakeholder will have exhibitions relevant to the wild life of Sri Lanka and zoological gardens of the Island. There will also be a display of live snakes, a unique experience for those fascinated by the rich wild life in Sri Lanka. The Sri Lanka Tea Board will feature a tea tasting centre with a display of the diverse tea available in the Island. Similarly the Handicrafts Board will have a sales outlet with authentic Sri Lankan handicrafts and a display of same. A bazar will also be found at the venue with sales outlets consisting of gift items for the season, Christmas décor, sweetmeats and many more. The five days of festivities will also consist of cultural shows being performed by the Sri Lanka Armed forces and Department of Culture and Sri Lanka Youth Council; their performances will range in music, traditional dances to modern choreography to cater to the variety of visitors at the venue. The true spirit of Christmas would not be complete without carols and a variety of schools and choirs of Churches will be performing carols during this event. A kiddies’ play area and children's entertainment will also be available at the venue for the enjoyment of the whole family. The Minister of Tourism Development and Christian Religious Affairs, Hon. John Amaratunga is keen to make this festive season a memorable one for the record number of visitors expected in the city this year. “After many years, the country is enjoying true freedom. This is the first festive season under the new government. I have been informed that many Sri Lankans domiciled abroad plan to take advantage of this and visit the country after many years. We want to make this a memorable visit for them and the thousands of tourists who will be travelling to the country,” said Minister Amaratunga. All activities will take place at the Arcade Independence Square from 19th to 23rd December from 6.00 pm to 11.00pm. It will be inaugurated with a spectacle of fireworks which is expected to be a major attraction. “Our objective is to position Sri Lanka as an upscale tourist destination and by organizing an event of this nature showcasing a glimpse of its varied attractions in one location while celebrating in a festive atmosphere would help achieve such aims" commented Mr. Malraj B.Kiriella – Director General of the SLTDA. A special double decker shuttle bus service organized by ‘Colombo City Tour’ will be available from selected Colombo hotels daily to and from the venue with live carols onboard.